Firstly, are the odours and pathogens which are continually sucked up your garbage chute from the decaying waste in your rubbish bins or compactor. Secondly, are the odours and pathogens which become airborne as a result of having a build up of soiling inside the garbage chute. The Garbage Doctor® is our range of air purifying systems to provide 24/7 germ and odour control within garbage chutes, garbage rooms and garbage compactors. 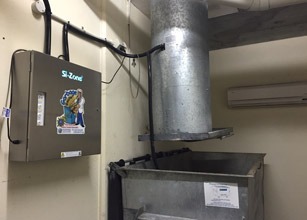 Because garbage chutes have a natural 'up-draft' (hot air rising), the odours and pathogens from within the bins or compactor can travel up through the chute, and escape throughout the building. The Garbage Doctor® equipment is usually installed at the base of your garbage chute, and provides continuous deodorisation and control for airborne pathogens at the source of the bins. By targeting the source of those odours, the air can be treated before it has a chance to cause odour issues by escaping the chute and entering the building. Professional chute cleaners will use specialised equipment to remove the dirt and grime that builds up on the inside walls of the garbage chute itself. The recommended period of time between chute cleans will vary; depending on the number of apartments using each chute, the climate in your State, and your buildings clientèle. As a guideline, most professionals recommend cleaning your refuse chute between 2 and 4 times per year. These cleans may be spread evenly throughout the year, but some buildings will find a benefit in arranging their chute cleaning so that there is a higher proportion of cleans in the warmer months. For more information on eliminating garbage odour within your chute, please see our page on removing garbage chute odours. For more information on having your garbage chute cleaned, please contact us on 1300-ODOURS (1300 636 877). Can we recommend a garbage chute cleaning contractor? We are familiar with the reputations of many of the chute cleaning contractors within Australia (including Sydney, Brisbane, Gold Coast and the Sunshine Coast), and we would be happy to recommend someone in your area where possible. Please contact us on 1300-ODOURS (1300 636 877) for more information. Why is garbage chute cleaning important? Garbage/trash chutes have a naturally occurring up-draft (similar to a chimney). 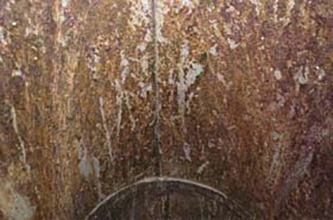 This causes unhealthy odours and bacteria from inside the refuse chute walls to become airborne. These airborne pathogens and odours then enter public areas as residents open the chute doors and dispose of their rubbish. Garbage chute cleaning should be used in conjunction with an effective and 24/7 germ and odour control solution, such as the Garbage Doctor®. Note: The Garbage Doctor® system, whilst very effective, is not a replacement for regular garbage chute cleaning. The two should be used in conjunction to address both sources of odours and germs within your refuse chute. How is your rubbish chute cleaned? Chute cleaning requires specialised equipment, and it is near impossible to do an effectively job unless you have the right tools. In most cases, a specifically designed high pressure cleaning system will be lowered down your refuse chute – where it will remove the sludge build-up on the internal lining. Generally, a good chute cleaning contractor will also clean around the rubbish chute doors on each floor of your building, as well as thoroughly cleaning the inside of your garbage room. Garbage Chute Cleaning in Australia; Brisbane, Gold Coast, Sydney, Sunshine Coast. If you are having odour problems in your garbage/trash chute, it would be our pleasure to assist you with a deodorisation system and by putting you in contact with a trusted garbage chute cleaning company.